Lance Cpl. Jennifer Winegar was pinned Cpl. 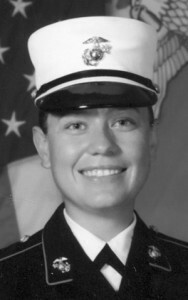 Winegar of the U.S. Marine Corps. She is currently serving overseas in Okinawa, Japan, for three years. She is the daughter of proud parents Barbara and Kevin Denner of Tooele and Don and Shawna Winegar of Salt Lake. Her proud grandparents are Bill and Jan Fox of Tooele and Wendall and Elaine Winegar of Ogden. Her proud sister and brother are Jessica Winegar of Yuma, Ariz., and Mike Winegar. Many others are also proud of her.